Welcome to Love Will Guide Us! We are so glad to welcome you to a new year of Religious Education at UUCC! If you are seeing this email, you have a child registered in the Love Will Guide Us class. You will see all the announcements about RE here or in the general RE news. What’s Love Will Guide Us all about? We welcome your seven and eight year olds to a warm and nurturing environment. This year is all about helping your child learn that love holds our community at UUCC. We are hoping to recruit some additional teachers, especially for the 9 am class! This year the Love class participants learn to seek guidance in life through the lens of our Unitarian Universalist Sources, with an emphasis on love. Together we ask questions such as, “Where did we come from?” “What is our relationship to the Earth and other creatures?” “How can we respond with love, even in bad situations?” “What happens when you die?” You will receive a short note each week with some information about what your children discovered, so that you can expand the ideas at home all week! Sunday school classes start on September 17th! 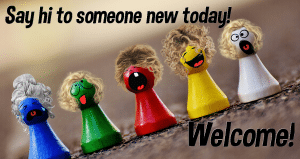 And remember; say hi to someone new each day this week, as part of our month of Welcoming! Welcome to the Spirit Play class! Welcome to Windows & Mirrors!